Kassandra Lamb was a psychotherapist for over two decades, specializing in trauma recovery. She has also taught psychology at Towson University as well as at other colleges. 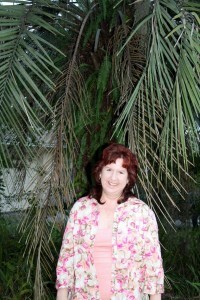 Now retired, she is enjoying the opportunity to pursue her other greatest passion besides psychology–creative writing. In a recent interview, the psychologist turned novelist said, “It’s always bothered me, when I read a novel, and the author has the psychology wrong. Now I get to write my own books and get it right… That part at least. I try to research things that are not part of my field, but I’m probably making mistakes in those areas some of the time. 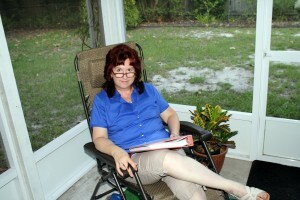 When not at her computer, transported in mind and spirit into the world of her characters, Kass lives in Florida, with her husband and her dog. They also visit Maryland often, to stay in touch with their roots. Standing in front of my very own palm tree! We have long beautiful autumns and springs in north Florida. I love editing and proofreading on the screened porch. Wow, great bio! Loved this glimpse into your life! I am from Florida originally, lived there for 25 years then moved to Texas. I miss the beautiful beaches and St. Augustine is one of my favorites. My protagonist’s parents are retired and live in St. Augustine. One of the books in the series is going to be set there. It is one of my favorite places on earth.